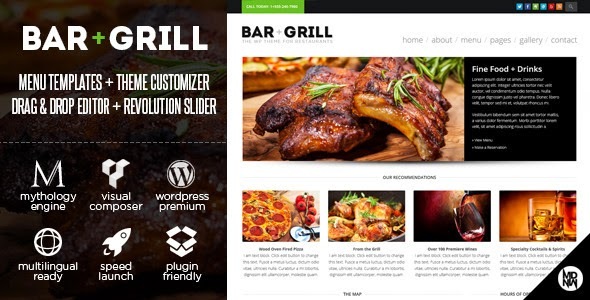 Bar + Grill is a responsive WordPress Restaurant Theme first and foremost. You can use it for other projects, of course, but we specifically created this one with restaurants, pubs, and small local businesses in mind. The full library of Google Fonts is included in the Theme Customize (and yes, live-preview works on the font-faces too). Just open up the customize panel and start playing! Perfect for restaurants, pubs, sushi, fine dining, bar & grills, bakery, cupcakes, wine, doctor’s offices, lawyers, food blogs, design studios, print shops, seafood, coffee shops, Mexican, steakhouse, pizza, Italian, white table cloth, local, open table businesses, yelp businesses, and lots more! Item Reviewed: Bar + Grill Restaurants and Local Businesses WP Theme 9 out of 10 based on 10 ratings. 9 user reviews.